When I met Savanah back in February, at least I think it was February, I met with her and her mother at a local yogurt place. 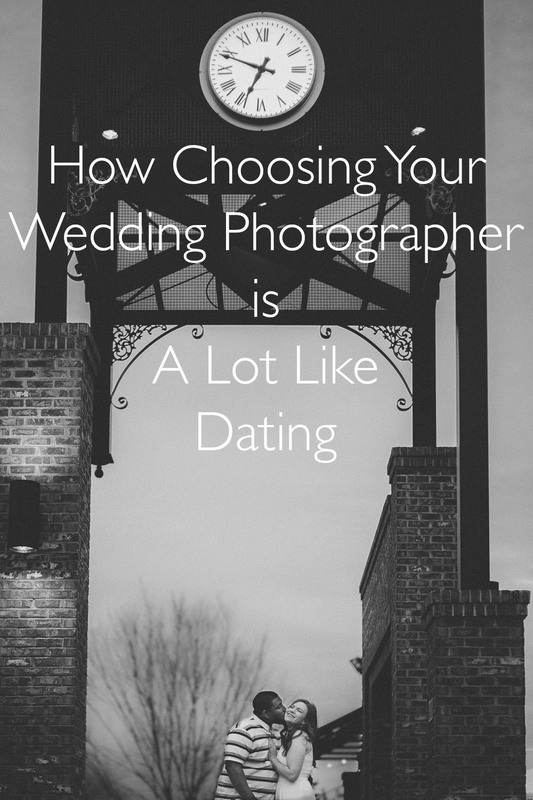 We discussed her wedding details, her dress, and lighting for the ceremony. When I brought up an engagement session, she told me that her best friend had already photographed their engagement photos and she showed me a few of them. They were great! Since her package included a photography session other than the wedding, we discussed either doing a bridal session or an ever after session. 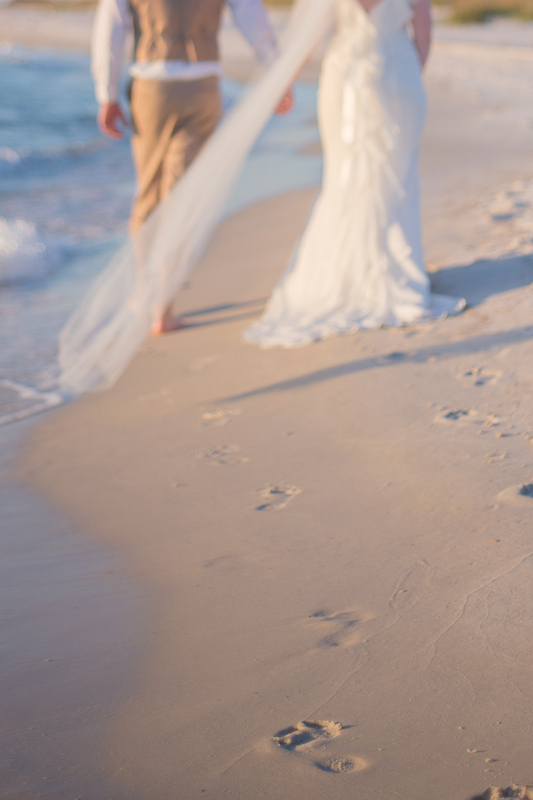 Savanah and Rob always wanted to get married at the beach. They LOVE the beach. They also wanted to get married in their church. This was highly important to them and they decided on a church wedding. 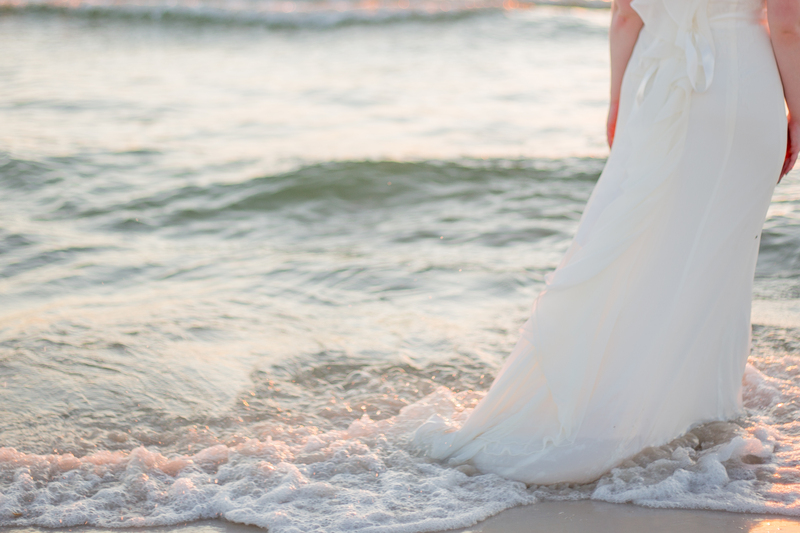 So, I suggested an ever after session on the beach so they could have it all! It was a beautiful clear day. Not a cloud in the sky! 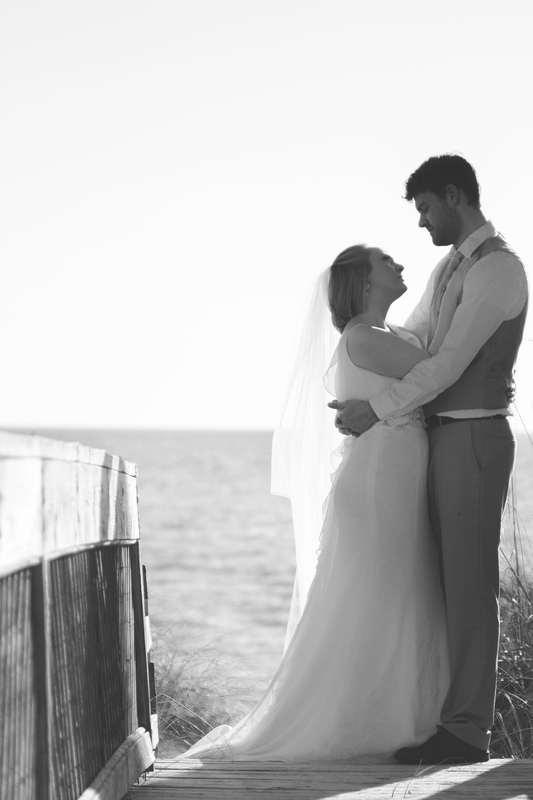 We met at The Port Inn in Port Saint Joe, Florida. They were kind enough to let us use their pool. Thank you, Port Inn! 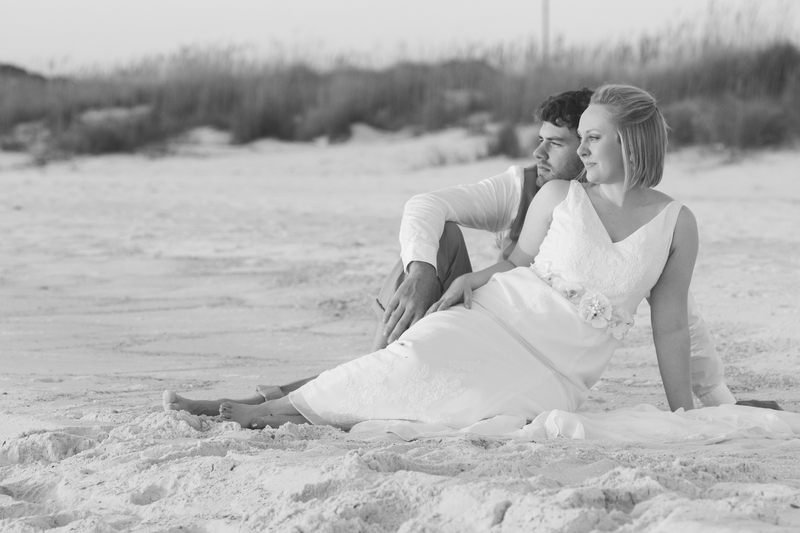 Once we met we got into my car and headed toward Cape San Blas. When we drove into the area we were met with thousands, and I mean THOUSANDS, of dragonflies! None of us had ever seen anything like it! We kept driving and thankfully the dragonflies dispersed the further we went. We came to the beach access which had a nice deck that overlooked the beach. We walked onto the beach and I got the idea of me getting into the water and looking inland at them. Something a little different, and I love the natural grasses and their reflection in the water! Then I took a couple of photos that I knew I wanted to do in Black & White. After the beach we went back to the hotel and walked across the street to the park. There was a gazebo/deck and I experimented with the flash. I hope you like it! 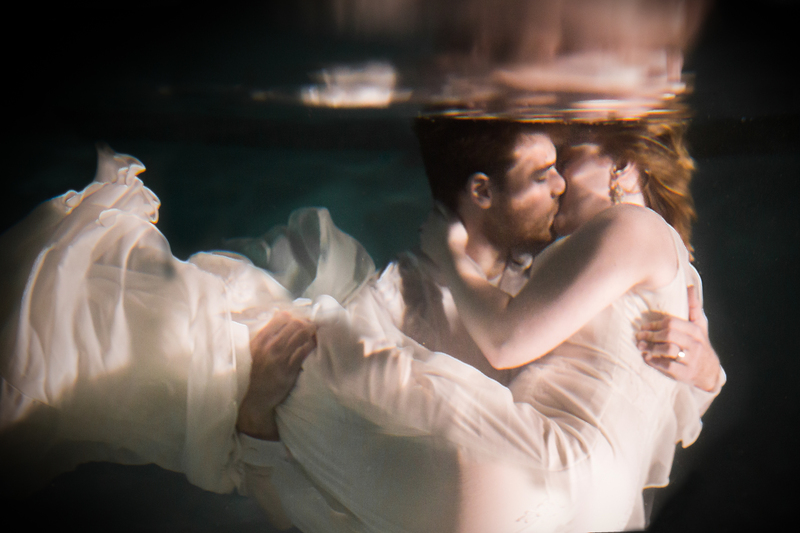 This last photo was so much fun to create! We went back to the hotel and got into the pool. There was a person on the second floor that saw us and said to someone in their room, “Are you seeing this?” Then they closed their window. Haha! This was my very first time getting an underwater photo. I hope you love it! I hope you enjoyed my first official Ever After Session. A special thanks to Savanah and Rob for being adventurous and giving me the honor of photographing them! If you like these photos, please like my Facebook page at www.facebook.com/KDProPhoto. You can also find me on twitter at www.twitter.com/KristenDPhoto. Let me know what you think of this session! Thanks for reading!!! Thanks for coming to my blog! I have an Ever After Session coming up this Saturday! I am crazy excited!!! What’s an Ever After Session? I’m so happy you asked! There are two categories of Ever After Sessions. 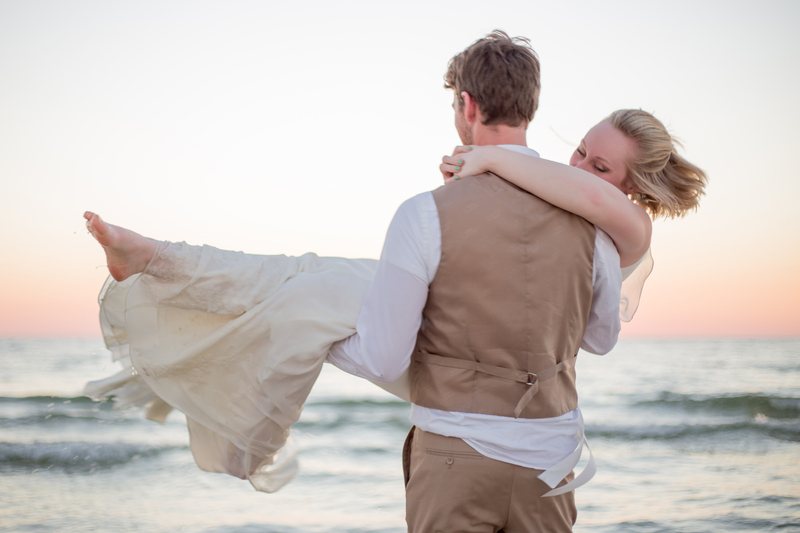 One is a photo session much like an engagement session, but in wedded bliss! It can be like the classic e-session, but can also be more personal by photographing the newlyweds in their new home together. How fun would it be to photograph newlyweds moving into their new home!? I would love to get portraits of them in the completely empty house, and photograph them building their life one box at a time. I’m game. Let me know if you love this idea, because I do! The second category of Ever After Sessions looks like the wedding day. This is what is happening this Saturday! 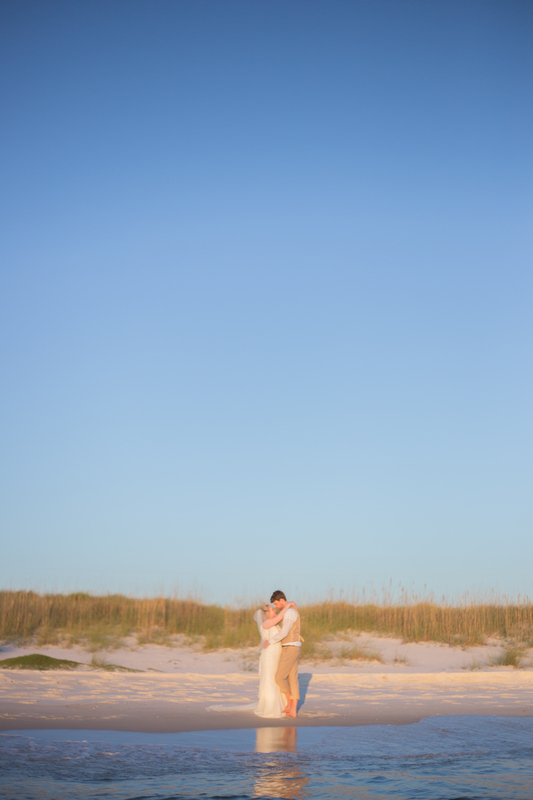 The Bride and Groom from my wedding in July are getting back into their wedding attire to have a fun session on the beach! We scheduled this after the wedding to take some unique portraits that we were unable to get on the wedding day. How unique? You will just have to wait and see! Come back and look next Monday for the photos! Also, check out my website at www.kristendphotography.com! My sister-in-law has a birthday today! We have been friends since college and we married brothers. So, we became sisters!!! How awesome is that? We always call each other ‘Friend’. Whenever we call each other by our names it sounds odd. It’s just not us. Today we are celebrating her birthday! In her honor, I baked a cake. 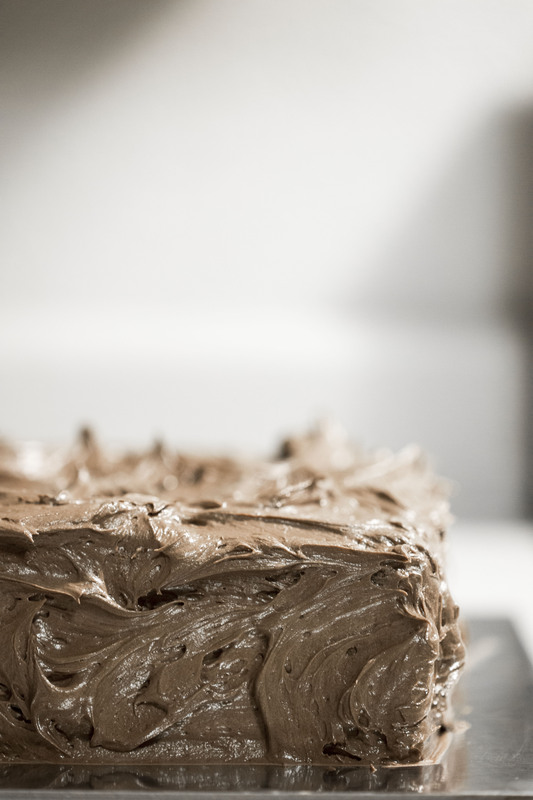 I like to bake… a lot. My husband cooks and I bake. It’s a great mix! 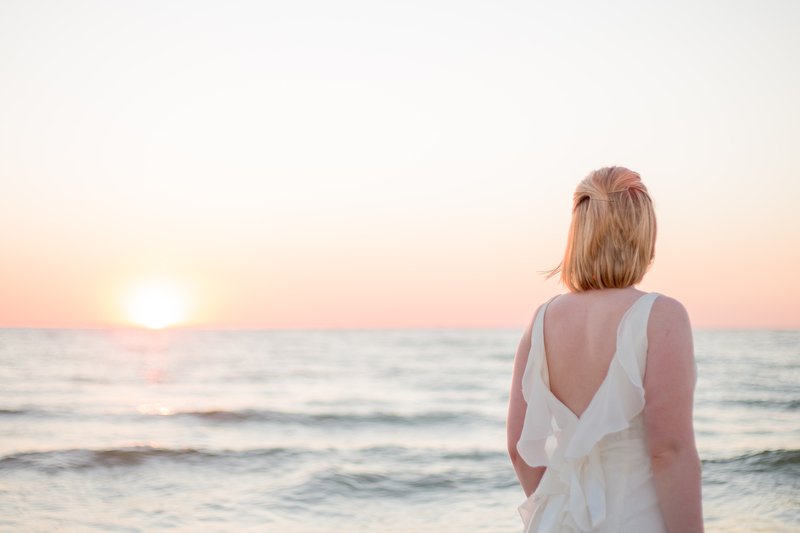 I am writing about Friend because she helped push me to move forward with wedding photography. One day we were discussing how I wanted to photograph weddings. I had been photographing babies, families, children, but I really wanted to do weddings. So simple, blunt, and exactly what I needed. That’s a mark of a true friend. Someone who will bluntly tell you what you need to hear in the love of friendship. Just a couple months after that conversation I had booked my first wedding and had multiple inquiries! 1. I didn’t have enough experience in weddings. 2. In order to get clients, I needed to charge crazy low, but knew I couldn’t afford to. 3. I didn’t have enough equipment. Each one of those concerns were done away with once Friend pushed me. I second shot weddings to gain some experience. I sat down and decided what I would charge based on my time, skill, equipment, and what I offer in each package. Brides inquired about me. I started booking. I bought equipment once I booked. Thank goodness I did! My first wedding had a power failure that lasted the entire evening. Their first dance was done by acoustic guitar and I had a video light that gave me enough light to focus and capture those precious moments. If it wasn’t for Friend it would have never happened. Happy Birthday, Friend! I love you! It was my senior year in high school and I was auditioning for All-State Band. I had been practicing for weeks, but I wasn’t nervous. I had just come from taking the ACT, so it had been an eventful morning. I signed in, and then walked to the flute area to check my audition time. I was the last one. Not near the last, or even second to last. I was the VERY LAST flute to audition. It was going to be a long day. I started practicing, and on my breaks I would find my friends and chat. Slowly my friends left, because they had auditioned and wanted to get home (we lived two hours away). It was me and my mom, and about two hours prior to my audition something happened. My stomach started cramping in a way I had never experienced before. I couldn’t stand up straight and couldn’t breathe as deeply as I needed to. My mom gave me crackers and water, but nothing helped. I had to lay in the fetal position to stay comfortable. 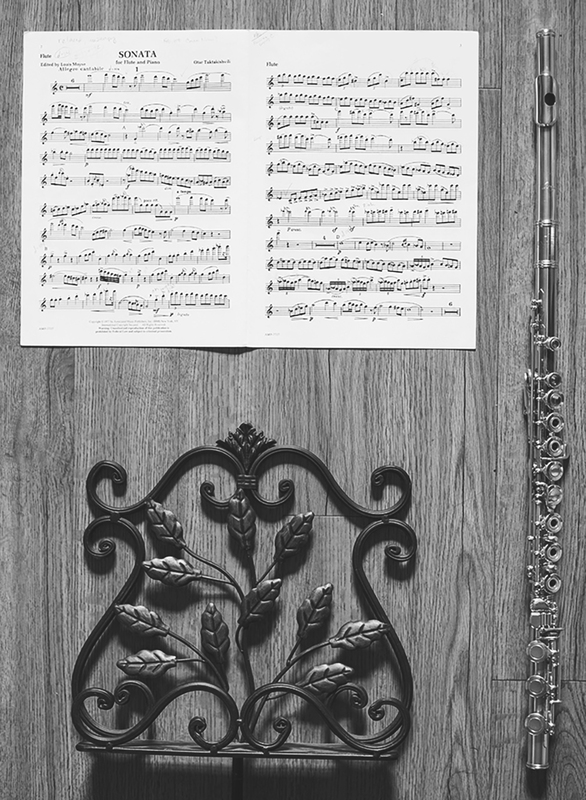 The time came for my audition, and the flute proctor closed the door behind me. I auditioned to the best of my ability, however, I was in pain and couldn’t breathe properly. I came out of the room and just looked at my mom. I fought the tears until we got to the car. I was devastated. That was my last chance to make All-State. I am telling this story because I have been reading Jasmine Star’s blog. 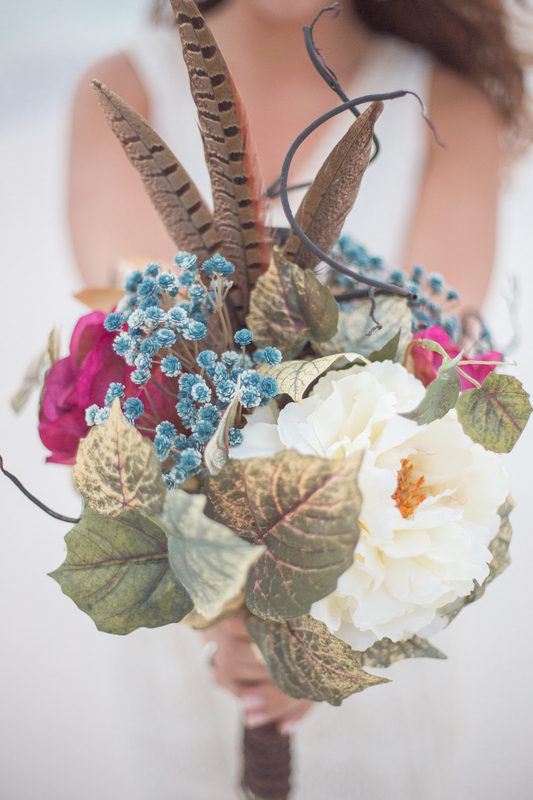 I highly recommend anyone that owns a business, especially photographers, to visit her site. In one post, she suggested to make a list of three things that make you unique (this is to help write a bio for a website). I seriously thought for a half hour and couldn’t come up with anything. I kept coming back to “What?! I’m not unique! I’m just a Kentucky girl who likes photography.” Then this memory came to me and I realized I am unique. My mom hit the nail on the head- I’m not afraid of anything. I am not afraid of putting myself out there and taking risks. I’m fearless. (Okay, well not completely. Spiders, wasps, and cockroaches are pretty high up there. If I see one, I run away like I’m on fire!) I’m not afraid to fail, because through failure comes lessons. It doesn’t matter that I didn’t make All-State almost a decade ago. What does matter is that I was there and auditioned even though I had every reason to walk away and knew I wouldn’t make it. So, my advice to you is to BE FEARLESS. Don’t worry about failure, because I guarantee it will happen. You can’t stop it, but you can learn from it. So look forward to the lessons. I invite you to come along with me while I build my business and live life! Let’s be fearless together and create something beautiful! P.S.- Here is Jasmine Star’s Blog. Go check it out! Thanks for stopping by my blog! This is the second entry of my Photography 101 series. 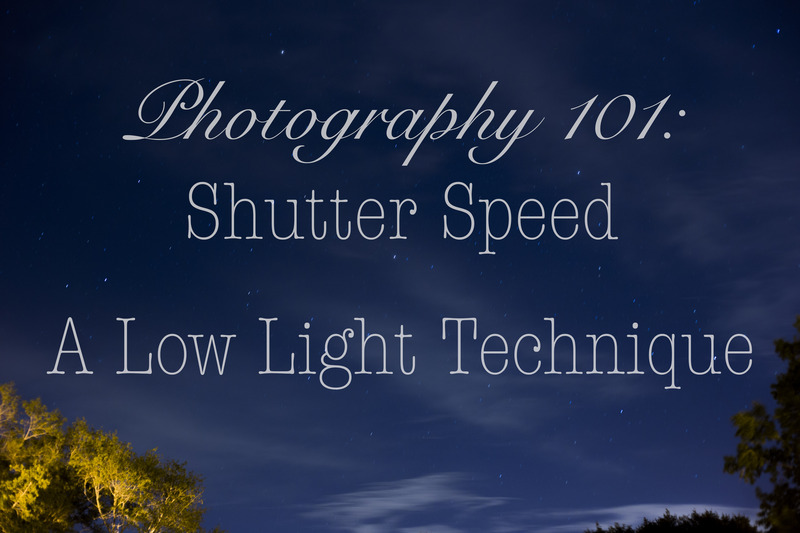 Today we are going to talk about Shutter Speed! You can have a lot of fun with shutter speed. This post is more focused on long shutter speeds with inanimate objects… for the most part. First we have to discuss what shutter speed does. Your DSLR camera has two things called curtains. The first curtain begins the photo capture by allowing in light. The second curtain is what signals the end of the photo capture by stopping the light. That is a very basic explanation of what the curtains do. For a more in depth explanation, please click here. How does this affect your photos? I’m so happy you asked! First let’s see how it affects the exposure. As you can see in the diagram, slower shutter speeds make a brighter image. This is because there is more time between the curtains, letting in more light. The faster the shutter speed, the darker the image. Let’s connect ISO and shutter speed. Do you remember that candle photo I asked you to take in my previous post? Did you have a bit of grain in it? Yeah, most likely you did. Take that candle and light it in a dark room (remember, safety first! Don’t burn down your house). Take your camera and put it on ISO 100. Take the shutter speed and set it to a full second. Since you have a very long shutter speed, you will need to have a tripod or a solid surface on which your camera can rest while it capture the photo. Ready? Set…. Go! What are your results? If you remember, a low ISO setting causes a darker photo, but less grain. A slow shutter speed will brighten the photo, because it lets in more light. Pair these two together, and you will get a well exposed photo with minimal grain. Whoa!!! Awesome. This works well with still objects and a stable camera. This technique is a life saver if you are photographing weddings and the room is dark. 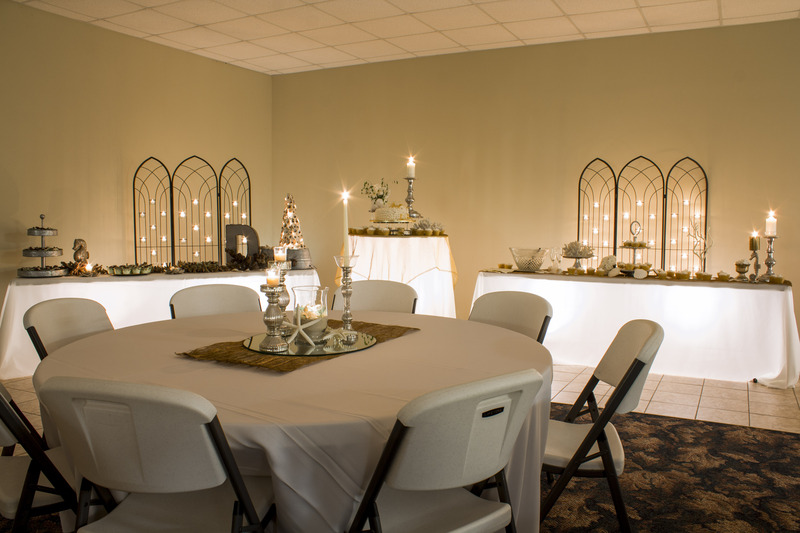 Here is a reception hall at a recent wedding I photographed. 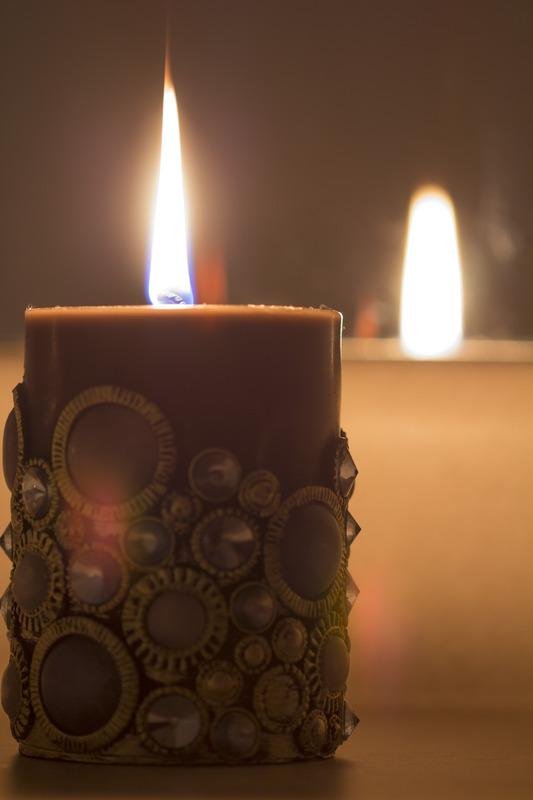 It was candlelight, and beautiful, and this technique is a must! This is also a good technique for photographing stars! I love star photographs. 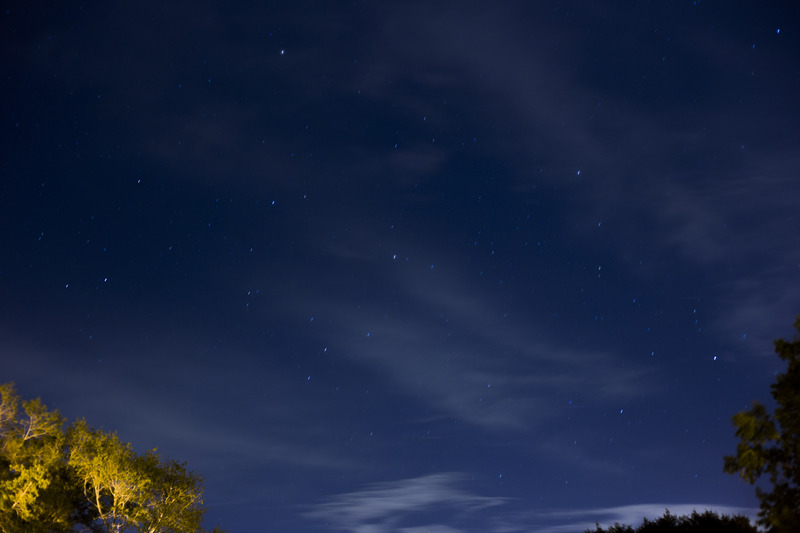 Again, you will definitely need a tripod or solid surface your camera can be placed while aimed at the sky. 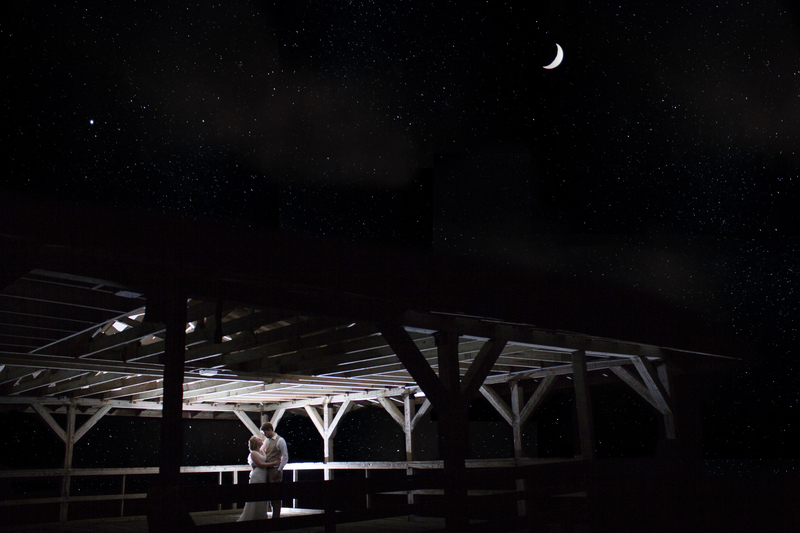 I did this one with a 30 second shutter speed, 3.2 f-stop, and 400 ISO. Now if you look closely, you can see the stars are making trails. Click on the photo to enlarge it, and you can see it more clearly. This is due to the earth’s rotation within 30 seconds. Yes, you can actually see the stars traveling across the sky! This is also a technique used for light painting… but more one that next time! 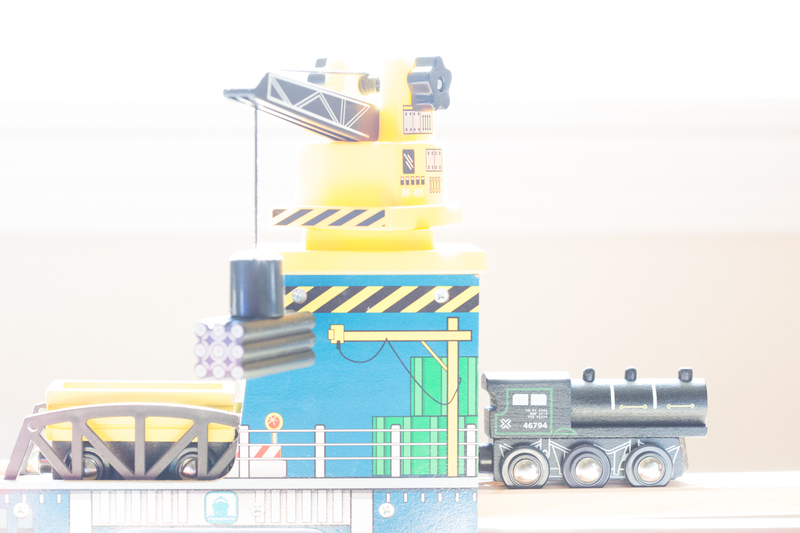 Thank you for coming by my blog! This is the fourth rewrite since switching blogs. This session was to provide an example for brides on how a bridal session may look. The lovely Haley helped me, and I love the end product! We drove to Florida together, and we went to Santa Rosa Beach first. The rain was pouring! We sat for probably an hour waiting for the rain to stop. Then, Haley had the brilliant idea of driving to Destin! Crazy dark for a light and airy photo session, right? We only worked for about 20 minutes, but I love the photos that came from this session! I hope you enjoy Haley’s Mock Bridal Shoot! Thank you or reading! Check out my website! Thanks for coming by my blog! This is the third rewrite since changing blogs. Let me just say, I absolutely adore this couple. They are so sweet, and so fun loving. I love working with them! This engagement session was photographed back in the Spring. Look for them again in October! I will be revealing Victoria’s Bridal Session right after her and Adrian’s ceremony! Thank you for reading! Be sure to look at my website! This is the second blog entry I am rewriting since I changed sites. This is Little Miss E- and she’s is adorable! She is my friend’s daughter, and so much fun! The session took place in the Dothan Botanical Garden. I love this place! I had an engagement session there as well. There are so many options for portraits. My personal favorites of Little Miss E are the two black and white photos at the end. Let me know which are your favorites in the comments below! I met Savanah and her mother back in February. I truly believe God brought us together for her wedding. I feel blessed just knowing this family and I pray for a beautiful marriage for the bride and groom. 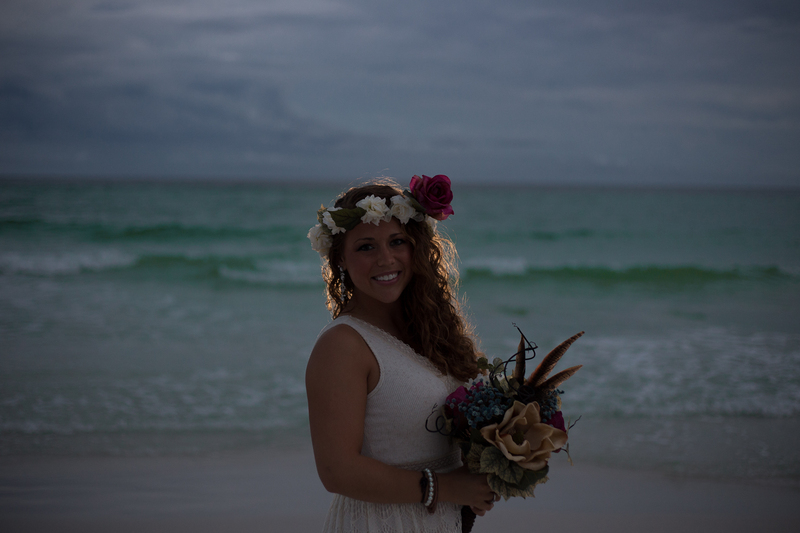 Savanah always wanted a beach wedding, but it was very important to her and Rob to be married in their church. With a lot of hard work, their family and friends brought the beach to them. This was a candlelight ceremony, and it was absolutely gorgeous. Thank you for visiting my blog! This is the first entry of my Photography 101 series. In Photography 101, we will learn how to use our cameras. What you need is a DSLR, your camera’s manual, and a can-do attitude. This series is for the beginner. I am also working on Photography 201, which is learning about light. Check back often for updates. We are going to experiment with only ISO today. ISO is basically how sensitive your camera acts towards light. Here is a diagram that explains the affects ISO has on an image. There is a compromise on each end of the ISO scale. Low ISO gives you a clearer photograph, giving your more details. However, if you aren’t in a bright room or outside on a sunny day, the low end will give you underexposed photographs. On the other hand, high ISO will brighten your image, but will add noise (also known as grain) in your photo. Here is an example using my son’s train set. I did adjust the shutter speed to keep the exposure the same in the above photos. 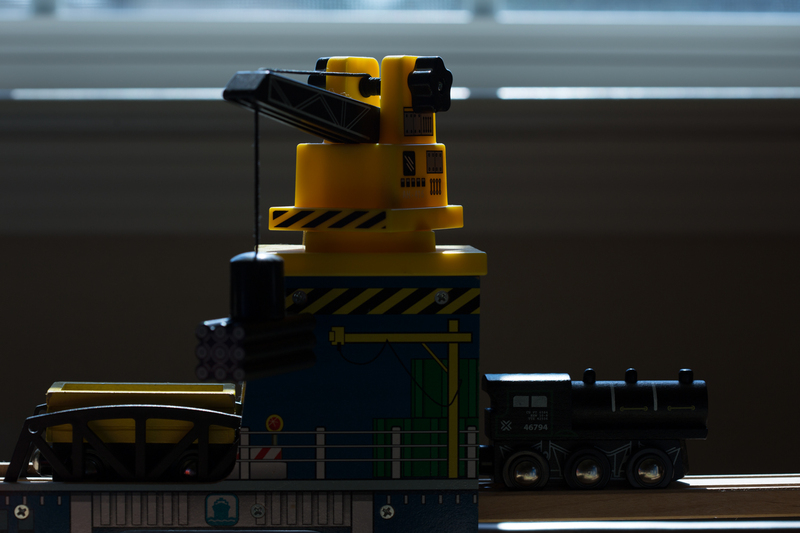 Do you notice how the ISO 100 image has no grain? Now, look at the ISO 6400 image. Do you notice the added noise? The noise (or grain) comes from your camera amplifying the light available. Let us look at how ISO affects exposure (how light or dark your image is, in brief). ISO usually begins at 100 and then doubles, with 1/3 stops between. In the following photographs, I kept the Shutter Speed at 1/125 and Aperture at 5.6. I only changed the ISO beginning at 100 and going to 6400. 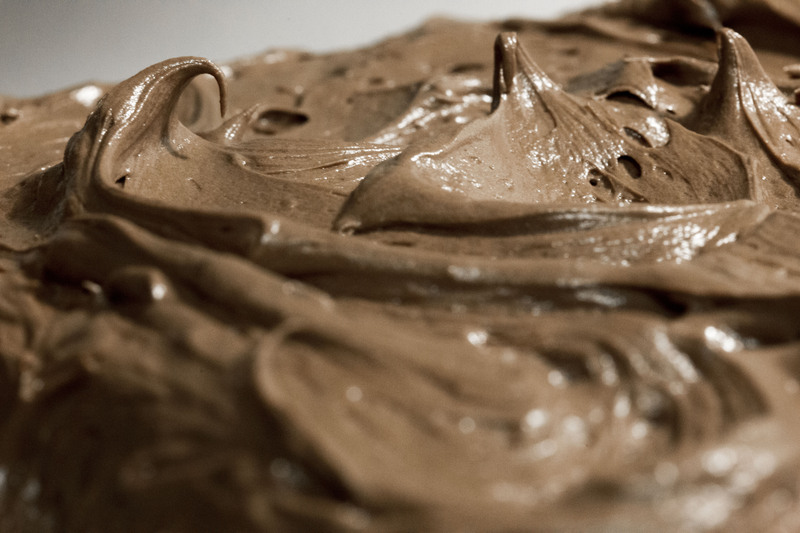 Now it is time for you to experiment. Take your camera and photograph something in the room. It doesn’t have to be pretty, I just used my son’s train set. Start from ISO 100 and take the photo. Repeat the process at ISO 200, 400, 800, 1600, 3200, and 6400. I’ll wait. 🙂 Now, review your photos. 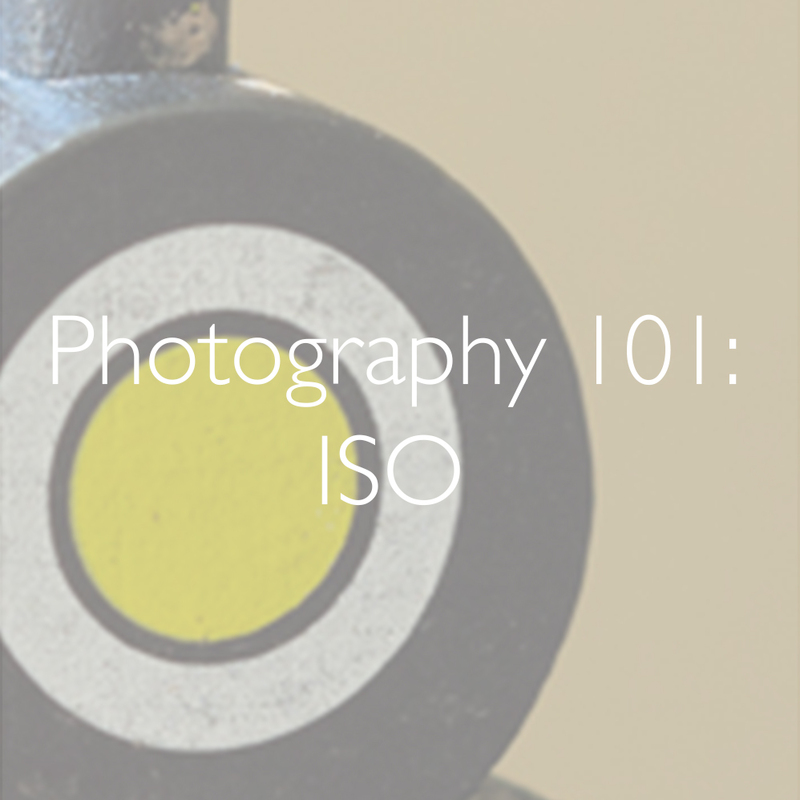 Which ISO setting do you like the best for your photograph? I like ISO 800 for mine. Your’s could be very different, because the room in which you took your photos will have different lighting than mine. Now for the second experiment. Is it sunny outside? If it is, then go outside and repeat the last experiment. I’ll be here when you get back. What did you notice about your photos? 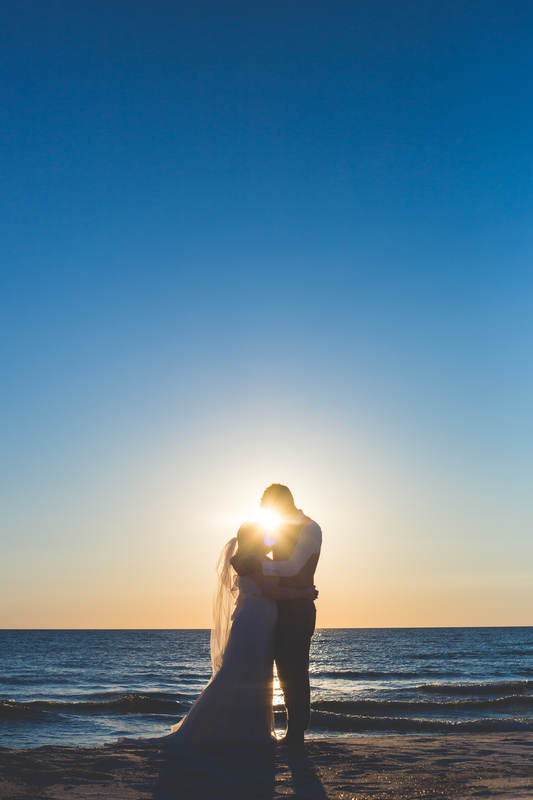 Did your photo start getting overexposed (overly bright) more quickly than your indoor photos? Most likely they did. That is because on a sunny day, there is much more light. Remember that ISO amplifies the light you have available. The more light you have, the more overexposed your image will be at high ISO levels. So a general rule of thumb is to use lower ISO in bright situations, such as outside on a sunny day. Use higher ISO in darker situations, such as school plays. Now it is homework time! Here is a list of photographs I want you to take and find the ISO you like for each photo. A flower on a bright, sunny day. A glass of water on your kitchen counter. A landscape on an overcast day. The One. You’ve already found “The One”. You are about to get married to him. 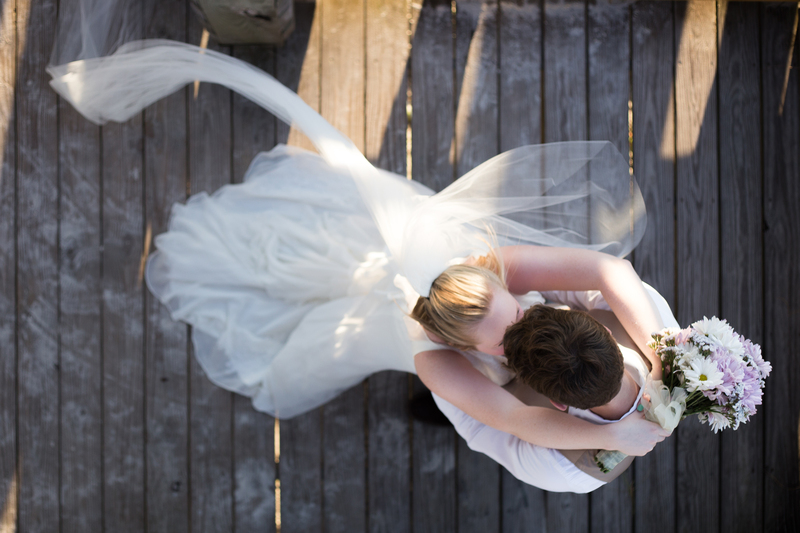 You obviously don’t marry your photographer, but he or she will be with you much more than most wedding vendors. This is the photographer whom’s company you enjoy. 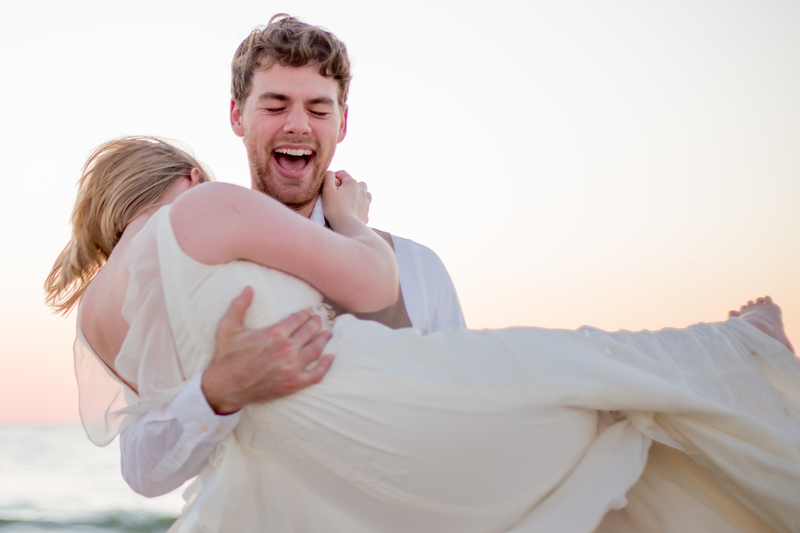 You can laugh and talk about aspects of your wedding like you are speaking with a friend.